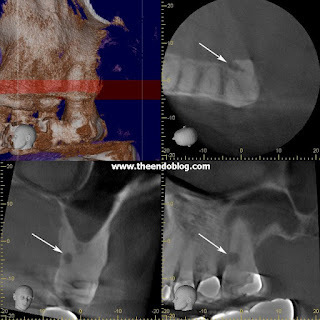 The following case shows the advantage of CBCT in endodontic diagnosis. The following patient returned to our office today for re-evaluation of #14. We previously looked at #14 which had some gingival swelling, yet we could not definitively diagnose the tooth as necrotic. We assumed the swelling was a periodontal abscess and had given him an antibiotic. He returned reporting no relief with the antibiotic and short, spontaneous episodes of severe pain. Once again our diagnostics were inconclusive. Normal to palpation, normal to percussion, normal to probing, responsive to cold on the lingual and unresponsive on the buccal, normal response to EPT. The canals were obviously calcified and the pdl looked normal around the roots. We decided we would take a CBCT to see if we could see any additional radiographic changes. The CBCT clearly shows a resorptive defect on the palatal. The CBCT also tells us the location (mesio-palatal), the size of the defect which allows us to make a restorative call. Look again at the initial film. There is no sign of this resorption with traditional 2D imaging. CBCT continues to surprise me. How are you planning to treat that tooth? I have referred back to the general dentist for evaluation of restorability. In my opinion, I don't think its restorable. The resorptive defect on the palatal root goes 40-50% down the palatal root. if the tooth is not restorable, the treatment of choice is extraction? 1. If the tooth was asymptomatic, then you could wait and watch until symptoms arise or we can see the lesion progressing, then extract. We really have no idea how fast this resorption has occurred. It may have been like this for several years. Perhaps it hasn't changed for several years? 2. In his particular case, he is having symptoms so I would extract and replace now.